I'm getting a message about graphics drivers not responding, things look terrible, and I have to reboot. Textures become blurred after a while of play. Mirrors are blurry and thumbnails are crunchy. Some or all of the graphics options are greyed out/unchangeable (check on the lot, not in the neighborhood or Create a Sim screens!). The screen goes black or freezes during the special event movies. The game is slow or jerky, especially when the settings are on high. The game is slow or jerky, especially when the settings are on high: This can sometimes be reduced by updating drivers or lowering unneeded settings like Reflections, and you may be able to do a System Checkup to further fix it. However, if you have a lower-powered graphics card, you may need to buy a new card, as described below. ... then you need to identify the type of card you have and update your graphics drivers. See below for more information. The game is still slow or jerky after doing a System Checkup, especially when all settings are on high. The computer still appears to be running but the screen goes totally black. The computer will not recover and I have to crash it and then restart. While this can be caused by more than just the graphics card, is it definitely a computer problem and not a game problem. I'm getting a message about graphics drivers not responding, things look terrible, and I have to reboot: This is most often seen on lower-powered graphics cards like integrated Intel IGPs. ... the solution is generally to purchase a new graphics card. See below for more information on that. Some information about Graphics cards and drivers. The graphics card (or video card) is the part of your computer which handles the images that you see on the screen. There are three types of graphics processors, dedicated, shared (sometimes referred to as 'onboard' or 'integrated'), and on-die (referred by AMD as 'APU'). A dedicated graphics card is actually a separate component that plugs into the the mainboard (motherboard) of the computer, and can be take out and replaced. These types of graphics processors are the strongest/perform the best. Shared graphics is simply a chip that is an integrated part of the mainboard. They are a lot weaker than any dedicated card, and they cannot be removed. However, in most cases computers which are running shared graphics chips can be upgraded to run a dedicated graphics card. For most PCs, buying and fitting a new graphics card is not difficult. If you have integrated graphics in a laptop you cannot upgrade your graphics card without also replacing the entire motherboard, if you can even upgrade at all, and the costs would be extremely high to the point that it would be better just to purchase a new computer. On-die graphics processors is also a shared graphics processor, but with the graphics processor built into the CPU. These types of graphics processor is much stronger than older shared graphics chip and some can even match the performance of low-end dedicated graphics cards. They are also power efficient, which can save on battery life. These new kinds of integrated graphics allow laptop gamers can experience playable performance playing Sims games without the need for an expensive gaming laptop with a dedicated graphics card. Example of on-die graphics are the AMD A-Series APUs and Intel's HD series. Gaming laptops are usually equipped with a dedicated graphics card (for performance) and an integrated graphics chip (for power savings). If you game on a gaming laptop, make sure your games (including TS4) use the dedicated graphics card for the best performance. Note that playing games while on battery power will reduce the graphics performance compared to when plugged in. The Graphics driver is a piece of software (code/ program) which tells the computer how to use the graphics card. The Sims 4 is a very demanding 3D program, and sometimes certain drivers can cause errors which appear as glitches on the screen. 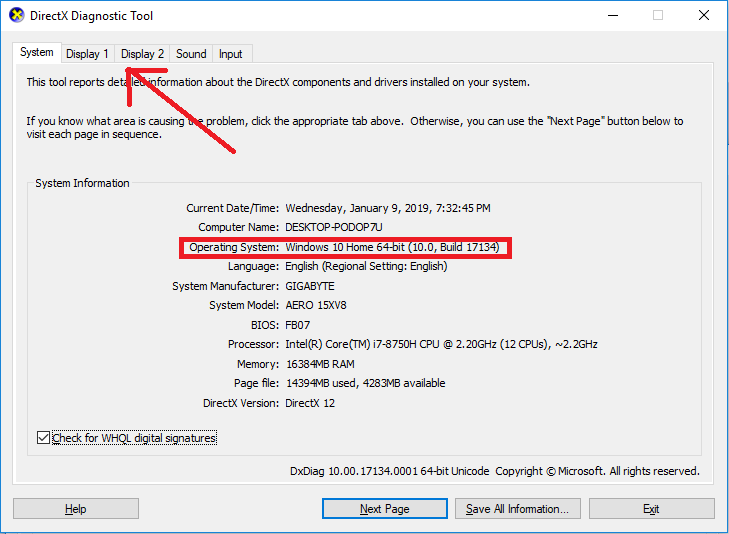 The drivers which come with your computer or graphics card are most likely not the newest, and so the most logical thing to try is to upgrade the drivers for the newest. 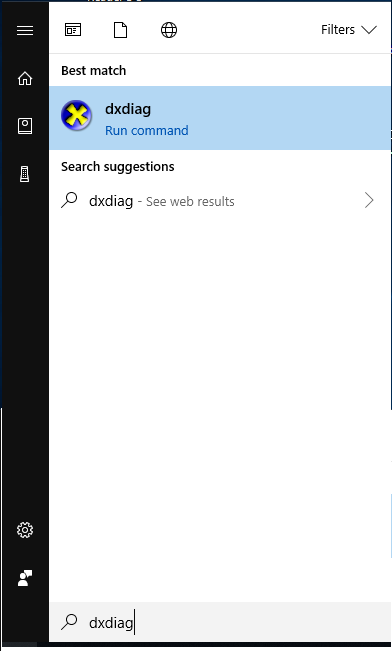 The easiest way is to click Start (Windows Logo) and then type dxdiag in the little box. Click dxdiag under Best Match. When the DirectX console opens, give it a few seconds until it has read your system components. From this screen you can tell your operating system (Windows 10 Home in this case). Then click on the display tab (where the arrow is). If you have more than one graphics card (in this case I have two since I am using a gaming laptop) it will have multiple display tabs. You should now see a screen which tells you the manufacturer of your graphics card, and what the model number is (in this case, an Nvidia GTX 1070). There is also a section about driver version, it looks complicated but if I take the last five figures I can see that I have the 391.58 drivers. You may like to write down your operating system, card name and driver version. What you should now do is to find out if there are newer drivers available for your card. If there are, you can download them to your hard drive for installation. 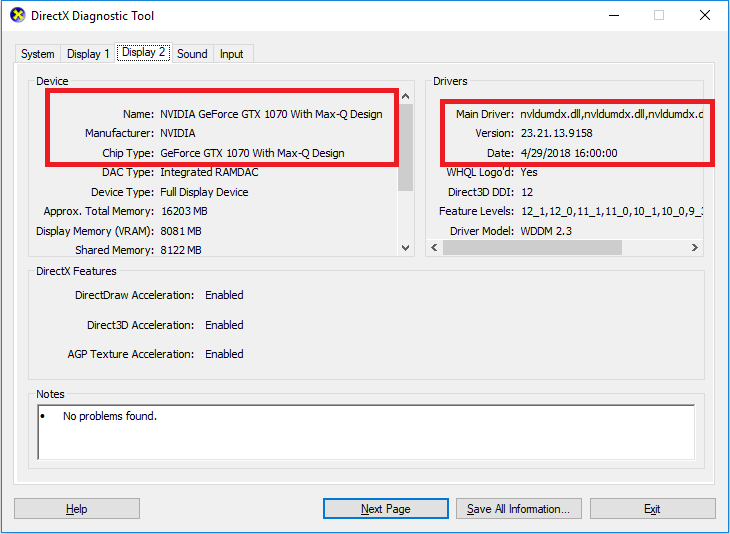 Nvidia: Click on the link below and click 'Auto-detect my GPU' or use the manual driver search. NVidia website If you have a laptop you may need to download your graphics drivers directly from the manufacturer of the laptop. Recently Nvidia has begun to provide support, so check out their website first. AMD: Click on the link below and follow the four dropdown menus. AMD Website If you have a laptop with an APU, you will probably need to get your drivers direct from the manufacturer of the laptop. AMD does support a small list of companies. For the list, check out AMD's website. The list of supported brands is included at the top of the page you would download the drivers from. Integrated/onboard graphics can still be downloaded direct from AMD. Intel: You need to get the correct driver for your chip. Start by clicking on 'graphics', 'Desktop graphics controller' OR 'Laptop graphics controller'. Follow the on screen instructions, putting in your chip version and operating system. Once you have downloaded the drivers to your computer, you can move on to the next step. Some of the drivers may be compressed (Zipped), in which case you’ll need to unzip them. Then, just run the installer by double clicking on it, and follow the onscreen instructions. Some people may like to uninstall the older drivers completely first by using either Windows Add/ Remove programs, or a third party program. This often gives better results and so is worth doing if you are having problems, especially if you have reverted to older drivers. One I have used is a free program called Driver Cleaner (archive download here) . There is a readme file included with Driver Cleaner which gives full instructions, and there is also detailed information on the website. There are also many other commercial programs available for cleanly removing drivers. Take care not to remove mainboard or other drivers inadvertently whilst doing this- especially if you have other devices of the same brand as your graphics chipset. This page was last modified on 9 January 2019, at 22:51.